In the first part, I set up the project and created a first test level with the help of a tile set and a tilemap. Now let’s have a look at two important parts of a game, the player controller and player pawn (character). The Blueman sprite is nice but not that thrilling after all. For my Jump and Run game I need some more animations / states anyway, so I built this little LPC character with a sprite sheet generator. Important tip: Set the pivot point to bottom center as this is the basis of a standing character. For the Hit animation I used a custom pivot point and lined the sprite up in relation to the smaller sizes of the other sprites. No hard science here, just some pixel pushing until it fits. 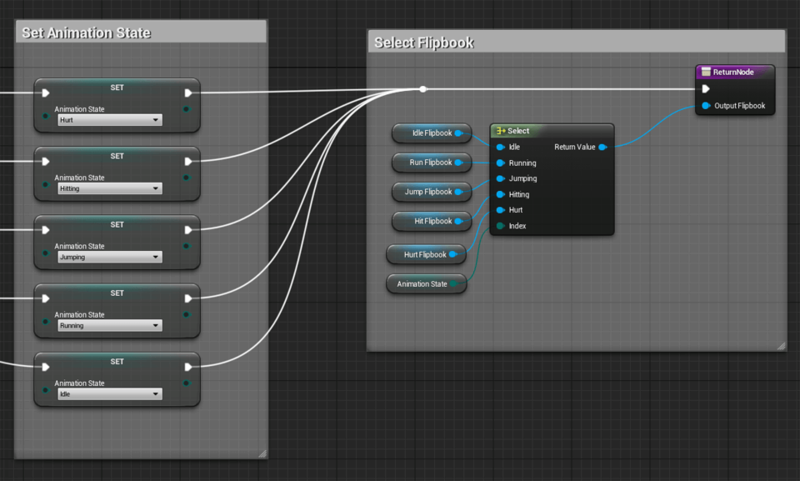 With these extra Flipbooks I extended the Animation State Machine from the Epic Tutorial Series (see above). I can switch to them via new bool variables the same way as with the idle and walking state. Here is a picture of the Player Controller Blueprint viewport where you can see the Collision Box in front of the sprite. On begin play this gets set to ‘no Collision’. The size is relative big as I don’t want to punish the player in hectic situations like jumping for and back while trying to hit some enemies. In other games you would just spawn a projectile or cast a ray or something else. I thought of this way to simulate a melee attack. Maybe you know a better solution? Of course this is just a rough explanation of what is going on inside my Player Controller but I hope I can give you some hints and starting points to explore it on your own. 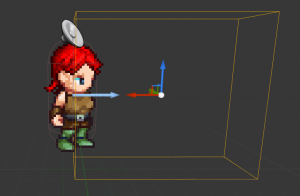 The next post is about the game mechanics ‘getting damage’, ‘die’ and ‘heal’ with the help of Blueprint Components. When will be added the third part? Nice work very helpful, can you please add some material examples like a change color of player, platforms etc?.. thanks…. I can’t make attack animation, I’m really confused how implement the attack animation into the Animation State Machine and the Event Graph. I have attack flipbook, but I don’t know how to add to the game. Can you make a video about this? I observed the instructions from the video. So how can I continue from here? My character disappears, when I start playing, but the camera is still moving, when I go left, right or jump. The attack state should be as high as possible in your chain. So it doesn’t get canceled by running, jumping, falling state. About disappearing: check the Y axis. I know this is very, very late. But I’m interested in how you implemented the sound. How did you did the sword attack part? And how would I implement that with say, jump noises or foot steps? I am not sure if I understand your questions correctly. The implementation is written very detailed with screenshots in the last two paragraphs in this article. Just add the sounds at the correct moment with a play-node (not location aware / 3D – just simple play sound). Sounds for movement, jumps etc. could be added inside the update-animation graphs. Please i know this post has many years but i need a solution as soon as possible. Have a look at the “Extend the Player Controller: Deal Damage” picture. There is a “actor has tag” node in it, which checks if the overlapping actors are tagged. You tag all your enemies but not the play controller. Now the damage will not be applied to your own character, as it doesn’t pass this gate.